I want to typeset a piecewise function - a function defined on two "pieces" of the domain. The pdf file I get when compiling the following code seems to have four lines, the first and third of which are blank. It makes for an ugly display. Browse other questions tagged math-mode spacing equations or ask your own question. How to write a function (piecewise) with bracket outside? 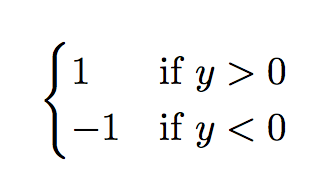 How to get more space in piecewise function on LaTeX? How do I define a piecewise function in latex?